A panel of U.S. and UN experts have issued a report detailing the methods North Korea uses to bypass international sanctions, Hong Kong's South China Morning Post reported Monday. 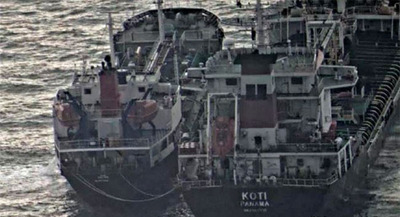 The methods include smuggling and bartering via Russian ports, forging the nationalities of ships, confiscating the wages of overseas laborers, modifying civilian-use equipment for military purposes, buying goods through bogus companies based overseas, smuggling in diplomatic pouches, and arms sales in Africa. The daily cited as an example of the barter trade a company called Dandong Zhicheng Metallic Materials, which was nabbed by the U.S. Treasury Department. The Chinese company bought steel and anthracite coal from North Korea in exchange for nuclear and missile components, it said. Public footage accidentally revealed an instance of civilian equipment adapted for military purposes. When North Korea unveiled the Pukguksong-1 missile in April at a military parade, the logo on a fuel tank carrying the missile read "Sinotruk." A UN investigation revealed that the company exported civilian trucks to North Korea from 2010 to 2014.